When “Proposition E” didn’t pass in June, Coronado Unified School District geared up for drastic budget cuts. “All of our schools are going to be continually hit by cuts until we can bring down our expenses to match our revenue,” said Dr. Jeffrey Felix, district superintendent. According to Silver Strand Principal Bill Cass, his school, the smallest in the district with 300 students in kindergarten through fifth grade, will be hit the hardest this year. Located three miles south of the Village in the Strand military housing, the school has a unique student body due to its proximity to the Naval Amphibious Base. Three-fourths of students have at least one parent in the military, resulting in high turnover due to military reassignments. While Village Elementary School, Coronado Middle School and Coronado High School will see their funding cut by approximately 4½ percent this year, Silver Strand faces cuts of 11 percent, including a sizable cut to the school’s unique Academic Support and Enrichment (ASE) program. “The ASE program addresses the instructional gaps that students may have coming from other schools,” Cass said. ASE is an approach to learning tailored to the student. Upon enrollment, students are assigned to the appropriate ASE group based on their skill sets. Small groups allow students to work on math, reading and writing with extra attention from teachers. The program is structured into the normal school day as well as before and after school, Cass explained. ASE has been a central feature of a Strand education and is widely credited with the school’s high academic standards and test scores. The school is ranked in the top 10 percent of public elementary schools in the state based on standardized test performance. Cass said the ASE individualized model of learning is particularly effective for Silver Strand students. “We have very high student mobility — 20 percent of our students will be new in the fall,” said Cass. The ASE program helps these kids get up to speed by giving them opportunities to excel in their strong areas and get extra help in their weaker ones. Due to the new budget constraints, ASE has been cut in half: at the start of this school year, instead of eight ASE teachers there are now four, meaning bigger student group sizes and less individualized instruction. “We’re just going to have to work harder,” said Cass. In the spring, the school laid off its computer lab teacher and part-time assistant principal. This year, students will lose the opportunity to participate in several popular extracurricular activities including robotics club and after-school band due to limited funds for such programs. 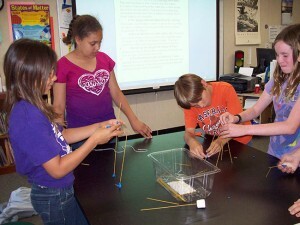 Silver Strand students work in small ASE groups to address individual learning needs. 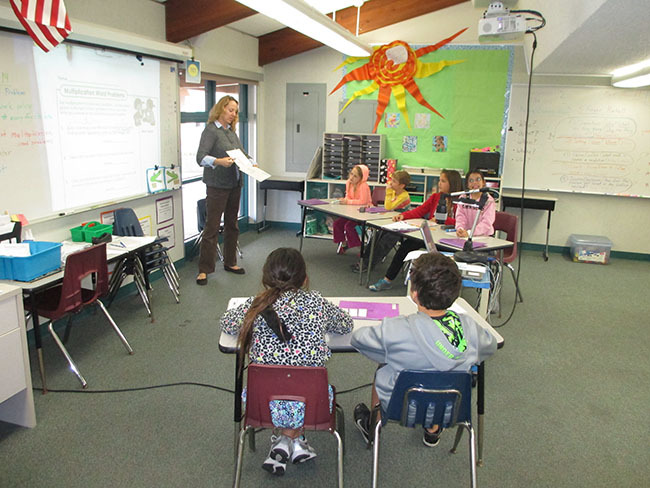 Silver Strand teacher Stephanie Tuckey works with ASE students. Tuckey is one of four ASE teachers kept on by the school. 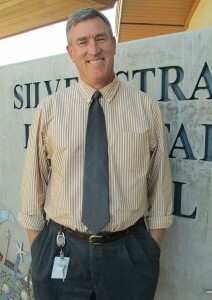 Silver Strand Elementary School Principal Bill Cass.